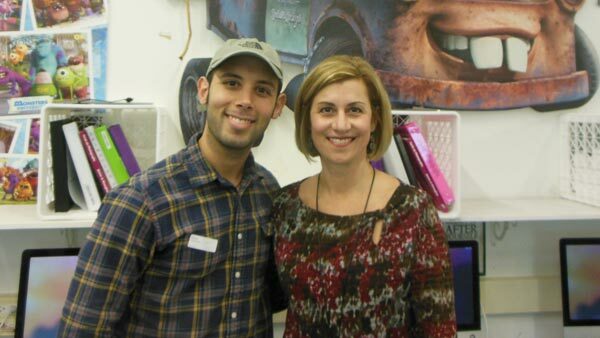 WTHS visual arts teacher Kirsten Smith welcomed Pixar animation artist and 2004 WTHS alum Lou Hamou-Lhadj to her animation classroom in December 2015. PHILADELPHIA (WPVI) -- When Lou Hamou-Lhadj walks the red carpet on Sunday, he might be able to hear the loud cheers emanating from South Jersey. Hamou-Lhadj, one of the writers and directors of the Oscar nominated animated short film "Borrowed Time," began honing his craft at Washington Township High School in Gloucester County back in the early 2000s. "My biggest takeaway from my time at WTHS is that I've never met a more committed and passionate group of educators as those I had during my time there. I'm still in contact with a good many of them - most retired at this point - and I feel that's a rarity. These are the types of people I gravitate toward and are of a similar ilk to those with whom we made 'Borrowed Time.' I'll never forget discovering that," Hamou-Lhadj tells 6abc.com. Born in Louisiana, Hamou-Lhadj moved to New Jersey at a very young age. His parents still live in his childhood home in Washington Township. The now 30-year-old Pixar character technical director would sometimes stay well past the final bell to work on a project for Mr. George's animation class or just to satiate his creativity; there he would see other students and teachers working around him on their own projects or in clubs. Kirsten Smith, the current animation teacher at Washington Township High, was fairly new to the school when Hamou-Lhadj was a student, but she had no doubt this animator-in-the-making was going places. "Lou was a very talented young man. In animation class, he was extremely self-motivated. He took other art courses besides animation to build up his foundational art skills. His art work far surpassed work of his peers!" Smith said. Before graduating in 2004, Hamou-Lhadj wanted to make his mark at the school by developing his first short film. Years before getting his hands on Pixar's state of the art equipment, the high school senior forced himself to learn school's animation software. "At the time, we had a few licenses for 3D Studio Max, which was the top 3D software. Most of his classmates were working on 2D animations. Lou sat at the computer and taught himself the software. He ended up creating a 3D animation, titled 'Ardinia,'" Smith recalled. "Oh man, I do," Hamou-Lhadj said. "With that project I forced myself to learn 3D Studio Max, and bullheadedly tried to make a little short film. I had no idea what I was doing, I was just learning the bare minimum of what I needed to make each shot, one at a time." The film, based on a new planet, won first place at the senior art show. "I think it likely won because no one knew what to make of it!" Hamou-Lhadj said. Despite nowadays living in the San Francisco area, Hamou-Lhadj's connection with Washington Township High School is as strong as ever. In fact, stills from 'Ardinia' are framed in the student gallery. And last year, he returned to the school to speak to Smith's animation class. "I always enjoy speaking with students, whether they're in high school or college, because of how rejuvenating it can be to meet people who are hungry to learn and have nothing, but excitement for the future. It's healthy for me, it grounds me and reminds me of how special my profession is," Hamou-Lhadj said. One of the stories that stuck with Smith's students is how Hamou-Lhadj and fellow "Borrowed Time" writer and director Andrew Coats would visit the Bronx Zoo to sketch the animals every weekend as college students at New York University. "My encouragement to those students was to draw often from life and train your observational skills, as everything you do as an animator will rely on your ability to observe and recreate, with the eventual goal of injecting your own opinion into your work," Hamou-Lhadj said. Though Hamou-Lhadj himself admits the first few trips were painful artistically, they maybe came back with one successful trip if they were lucky, the practice eventually paid off. But, it was those unsuccessful efforts that really got the WTHS students thinking. "Lou talked to them about how he used to just go to the zoo and draw for hours in his sketchbook, just to get better at drawing. The students especially liked the examples that failed. It was so interesting for them to see the whole process behind the scenes," Smith said. 'Ardinia,' zoo sketches, and a degree from NYU eventually led Hamou-Lhadj to Pixar. In fact, he was offered a job as an undergraduate while working as an intern on WALL-E, but declined in order to complete his studies. He accepted a position upon graduating. Throughout his ten years at Pixar, Hamou-Lhadj has worked as a Character Artist on feature films such as Toy Story 3, Brave, and The Good Dinosaur. After a few years, he was rejoined with NYU classmate Coats at Pixar. At Pixar, Lou Hamou-Lhadj has worked as a Character Artist on WALL-E, Toy Story 3, Partly Cloudy, Day & Night, Brave, Toy Story That Time Forgot, and The Good Dinosaur. A short time later, the two began brainstorming an animated short that would take five years to complete. "Shorts are a great way for filmmakers to enter a larger conversation and share their voice and perspective without the financial burden, time and resources that a feature requires. For us, if we wanted to make anything at all, it always had to be a short out of necessity. But I think that comes with opportunity, as shorts, in our opinion, are often like poetry and require a very different angle of attack and frame of mind than a larger film.," Hamou-Lhadj said. "Trying to pack six-and-a-half minutes with as much emotional resonance as possible is a great challenge and one that we are grateful we took on." But entering the world of animated shorts was a different experience for Hamou-Lhadj, Coats, co-writer Mark Harris, and the entire "Borrowed Time" team. They were on their own. Their decisions. Their mistakes. Their film. "Ordinarily, we are much smaller pieces of the puzzle, but through this, every member of the crew had a heightened stake in what we were making and for that reason, I feel the working experience was that much more rewarding. You hear it often from people in our industry that small teams are the most fun to work on, and now we know why," Hamou-Lhadj said. "Borrowed Time," now available on VOD services, iTunes, Vimeo, and Amazon, is one of five films in the Oscar's "Best Animated Short" category. It is a tale about a weathered sheriff facing a mistake he made a long time ago with different tone than a Pixar film. "For us, we are always super grateful to have worked on the amazing films we have which are rich with heart and comedy for people of all ages, but that's well represented in the public eye. We wanted to further the conversation that animation can be anything, including mature yet tasteful meditations on themes of grief, loss, closure, etc.," Hamou-Lhadj said. Working on the film in their free time, the team wanted to make sure they got their vision across in the running time a short film allows. "We found we needed to center it around closure, and the power that objects can have when we endow them with the memories of people we've lost. It only took us 2.5 years to crack that nut," Hamou-Lhadj said. The six-and-a-half minute film has been well-received in film festivals around the country including winning the Grand Jury Prize at the 2016 Nashville Film Festival and First Place Animation at the 2016 USA Film Festival. But it was still not a certainty that the film would be named during the Oscar nomination announcement in January. Certainty or not, Hamou-Lhadj and Coats were not going to miss the moment. "Andrew and I went to our producer Amanda Jones' house at 4 a.m. along with our significant others. Come what may, we were determined to celebrate how far we had come and could never conceive of the idea of sleeping through the announcement! Luckily, the tears we shed were those of sheer elation and release of months of pent up stress waiting for that moment! And then the cosmos decided to balance out and I had to report for jury duty that morning, through the next week!" Hamou-Lhadj said. While those behind "Borrowed Time" are thrilled over their nomination, they did not go into the filmmaking process with an Oscar nod in mind. As Hamou-Lhadj points out, just like back in his Washington Township High School days, it was all about the passion. "We made the film for the love of making films and it was a huge passion project for everyone involved - all volunteer based, and with the goal of just making something different from what we normally work on. That was it: let's make a film that can add to the diverse pantheon of animated films and contribute to that conversation in a way we haven't seen," Hamou-Lhadj said. "Over five years of nights and weekends, you can easily lose objectivity as you get pulled into the minutia of the craft, there's no time nor opportunity for what if's as large as 'could this win an Oscar?'" But that is now the question - "Could 'Borrowed Time' win an Oscar?" And should it win - will Hamou-Lhadj and the team have a speech written? "It's a work in progress, but absolutely - we don't want to be caught off guard!" Hamou-Lhadj said. So when Lou Hamou-Lhadj does walk that red carpet on Oscar night Sunday, he will not be walking alone. He will be joined by his biggest supporter, as well as one important couple from South Jersey. "I'll be bringing my fiancé, Nancy Tsang, who was a huge contributor to the film's visuals and stuck it out with me through thick and thin on the entire production, as well as my parents - they're ecstatic to go!" Hamou-Lhadj said.